NOTES: Itinerary will be subject to traffic and weather. The order of the visits might be rearranged for better service. Your pleasant trip will start upon landing at Los Angeles international airport. The tour guide who wears blue uniform will meet you at the baggage claim area (for U.S domestic flight) or flower shop of Tom Bradley Terminal(for International Flight). A formal day-by-day tour itinerary will be provided to you by the tour guide, and then you will be transferred to the hotel for check in. 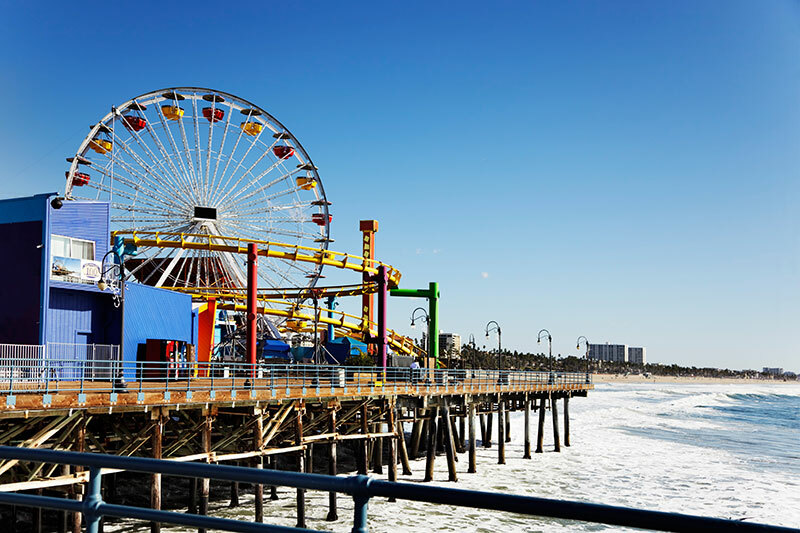 If you arrive in Los Angeles before 5:00pm, you may join Santa Monica tour at your own expense ($25). You are free to enjoy the golden beach, famous marina play ground, luxury shopping street, various restaurants and street performance. Los Angeles Airport pick up time by tour guide only available at 8:30 AM to 10:30 PM (for U.S domestic flights) or 8:30AM to 9:30PM (for international flights). Customers need to go to red waiting area outside of the terminal to take free hotel shuttle by self if beyond the pickup time frame. 1) All travelers will be able to stay within the Fashion Outlets for shopping before arrival at Las Vegas. 2) Stratosphere Tower is the tallest building in US West and our guests are able to appreciate the fantastic night view of Las Vegas at the 108 storage sightseeing deck of the tower. 3) Las Vegas night tour is highly recommended, and will be lasting 4 hours covering so many Landmark attractions of the Sin City, such as Venetian, Volcano eruption in front of Mirage, MGM, Mandalay Bay, Luxor, Excalibur and so on. 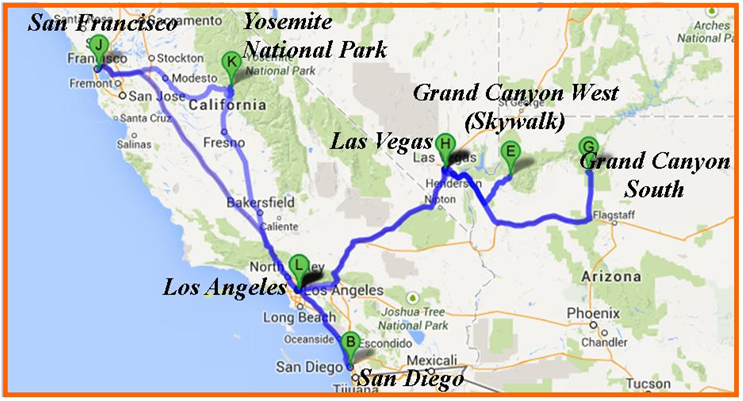 Drive to Hoover Dam in the morning, sightsee this largest and tallest concrete structure of its time. 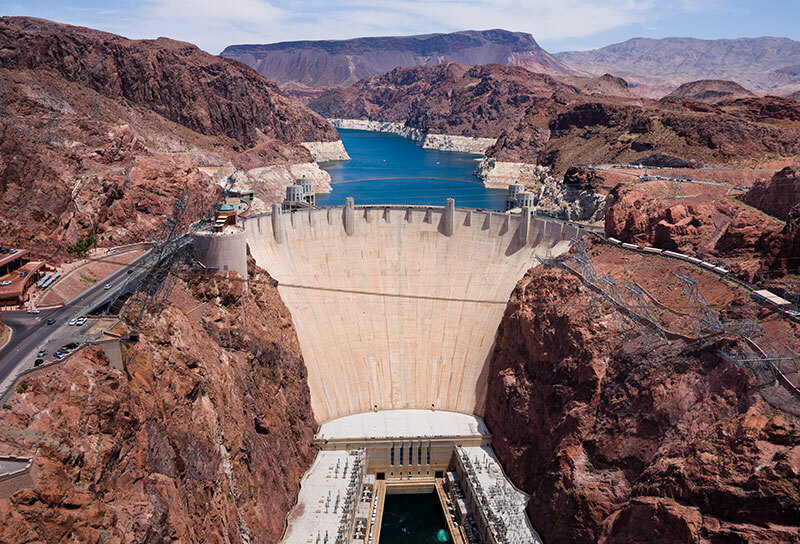 Visit the dam and overlook North America's largest artificial lake - Lake Mead. 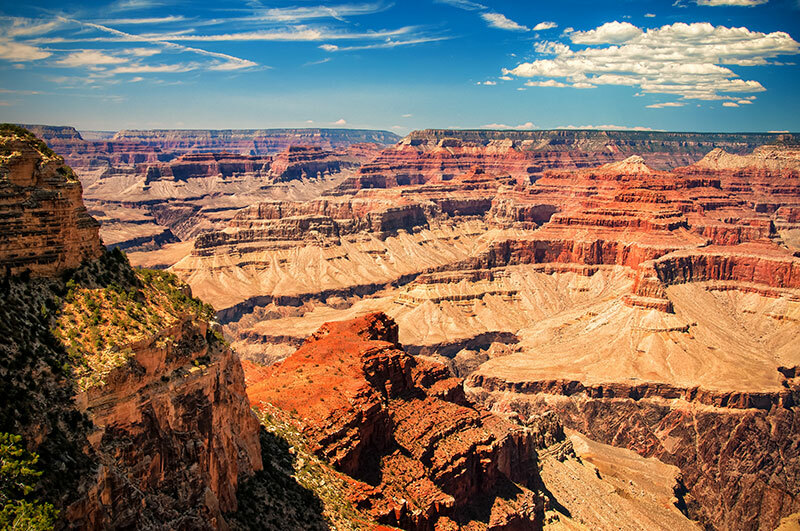 · West Rim (Skywalk): Over eons, the Colorado River and erosion have sculpted this amazing landscape. Grand Canyon West Rim belongs to Indian Reservation (Mandatory Admission to Grand Canyon West Rim). The group will take the designated park shuttle to enter the canyon. Upon arriving in the terminal, you may take the helicopter ride and sightseeing boat tour (Optional), in order to feel the canyon and Colorado River from different perspective and explore the true beauty of the Grand Canyon. Afterwards, you may take the park shuttle to the next sightseeing spots, Eagle Point and Guano Point. 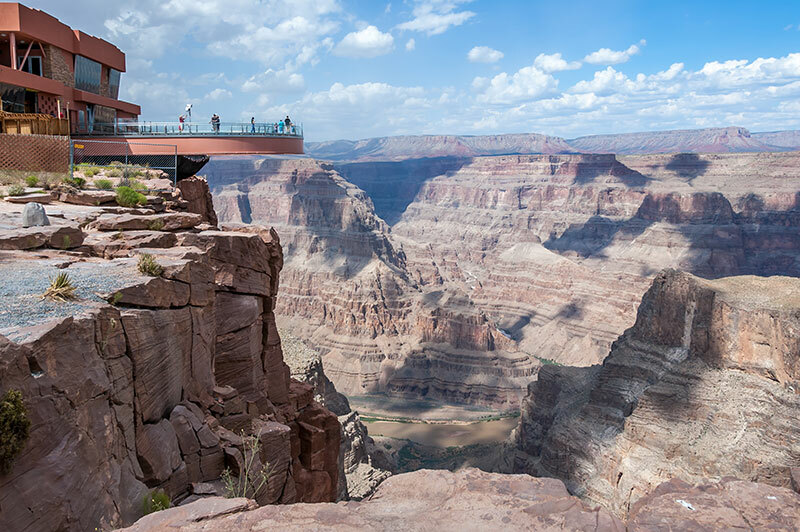 At Eagle Point, you may take an optional visit to the "Skywalk", which is the new gigantic construction built on the very edge of the Grand Canyon West Rim. The group will return to Las Vegas in the evening. 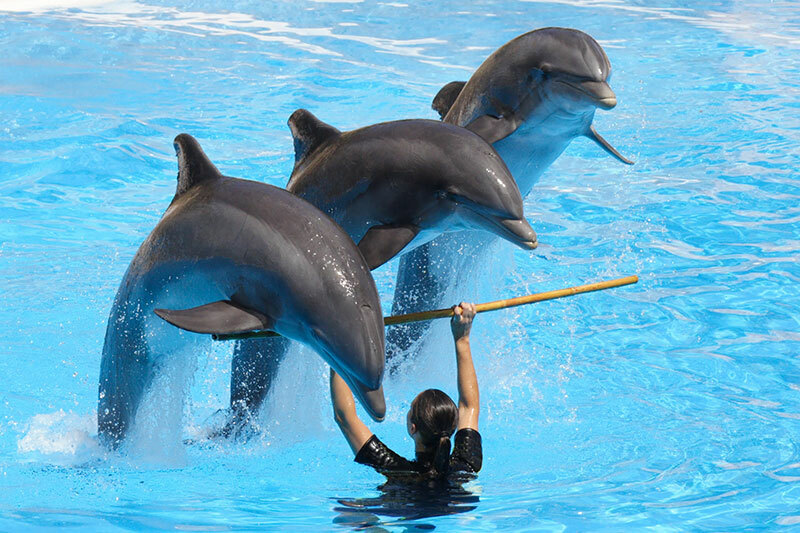 You may watch the world’s renowned show at your own cost (optional). · South Rim: Here is the world's most vivid erosion model, which is why the Grand Canyon has not only become a textbook for the geologist and paleontologist, but also made the millions of tourists each year filled with emotion when they face the masterpiece of creator. You may watch the IMAX movie of the history of Grand Canyon at the entrance at your own cost. Then, go to the largest view point near visitor center - Mather Point. If God is the creator of the Grand Canyon, Colorado River is an artist who has carved the Grand Canyon. Despite the passion in summer and the cold in winter, the river and valley’s history of romance has been going on for six hundred million years long. Sunshine and clouds are always alternating controls over the canyon, adding a dash of style to the magnificent scenic picture. (Mandatory Admission to Grand Canyon South Rim) The group will return to Las Vegas in the evening. You may watch the world’s renowned show at your own cost (optional). ***If you do not make an option of West Rim and South Rim, but choose a free day option that you will be charged with a $30 fee. People who enjoy buy 2 get 1 free or third person, fourth person special offers also need to pay $30 fee. Only infants under 3 years old not occupying a seat would be waived such charges. 1) Ethel M Chocolate Factory: You’ll be able to take a tour to see how chocolates are made. 2) Cactus Garden: Allow you an up close look of many different species of cactus and desert plants from around the world. 3) Tanger Outlets: The popular outlet shopping center located in Barstow provides you one more chance to do some discount shopping before arriving back to Los Angeles. *You may leave the tour group from Las Vegas and arrange your own ground transportation to LAS Airport. In addition, please schedule your flight departure from Las Vegas after 1:00pm in the afternoon. * Please schedule your flights to depart from Los Angeles airport (LAX) after 8:30p.m ( U.S domestic flights) or 9:30p.m (international flights). Note: Any delayed flight due to weather conditions or any circumstance which is unable to arrive before 10:30 PM (U.S. Domestic Flight) or 9:30 PM (International Flight) for the free airport pick up, customer will be charged extra fee for the late transportation.